Frustrated of getting a nice bedside table? Check out the Ana Solid Oak Storage Unit – Available in full oak or oak with walnut drawer accent. 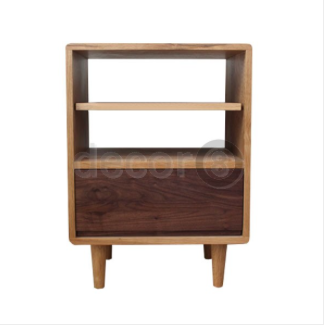 The Ana Solid Oak Storage Unit is perfect for putting next to your bedside or next to your sofa. Made by solid American oak wood, the Ana Solid Oak Storage Unit has an unparalleled quality among other furniture made by other materials. Solid wood is regarded as the best quality wood for furniture. The best thing about this wood is its long durability – the furniture lasts more than the period of 10 years. The pieces are highly reluctant to decay. And as far as the looks are concerned, you won’t find any other wooden furniture as attractive as hardwood in the market. Solid wood has such a luster and elegance that it can provide the same beauty and grace without any need for veneers. Meanwhile, to embellish the appearance of the Ana Solid Oak Storage Unit, you can have a walnut accent or it may be purchased in full oak of course. With a smooth slidable drawer the Ana Solid Oak Storage Unit provides you the best convenience to store your accessories in a succinct manner. Here we provide you some useful tips when creating your storage access: Think Vertically! Despite its limited square footage for most Hong Kong households, Try to install deep shelves high above your heads if you have a high ceiling. They were great for stuff you don’t need often, like luggage and boxes of off-season clothes. To avoid expanding shelves into the room itself, think of removing some drywall and creating recessed spaces between the studs. You can add doors to install shallow shelf inserts. On the other hand, if you have limited space around the bed, get a multi-purpose bedside table with cabinets to hold lamps, books and glasses. Also, seek some tall, narrow dressers, armoires and corner cabinets to maximise your small bedroom’s storage space. This entry was posted in Cabinets, Drawers, Wardrobes, Mini Storage, Multi-Functional Storage, Shelving Systems, Storage and tagged bedside table, hong kong shelving systems, mini storage hong kong, modern design storage, multi-functional, solid oak shelving systems, Storage Unit, wood.